Earn commission on credits purchased through your custom affiliate link - enroll today! 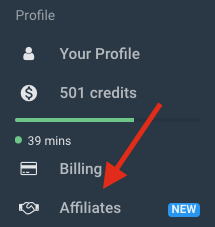 To become an affiliate please create a Radius account. After logging into Radius, you will find an enrollment link in the "profile" section of the menu. The link will prompt you to create a First Promoter account. Upon creation of your affiliate account you will be prompted to fill out a W-9. If you do NOT fill out a W-9 we can NOT approve your account or authorize payments. If you close the screen by accident you can fill out a W-9 here. Please give us 24 hours to review the submissions and approve the account. Upon approval you are all set to start earning! To find out more about how the affiliate program works see the help article "How the Affiliate Program Works"